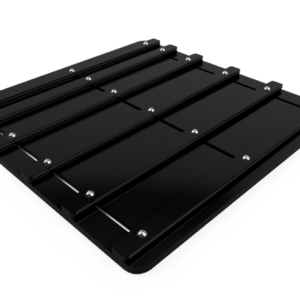 Magnet Support For ShapeShift Evo Trays! Combine the ShapeShift system with the versatility of magnets for unlimited carrying capabilities in one bag. Yes, the ShapeShift system is a superior solution to magnetizing models – mostly because you get the same benefits without having to magnetize your models! But what about the cases where magnets are the only viable solution? 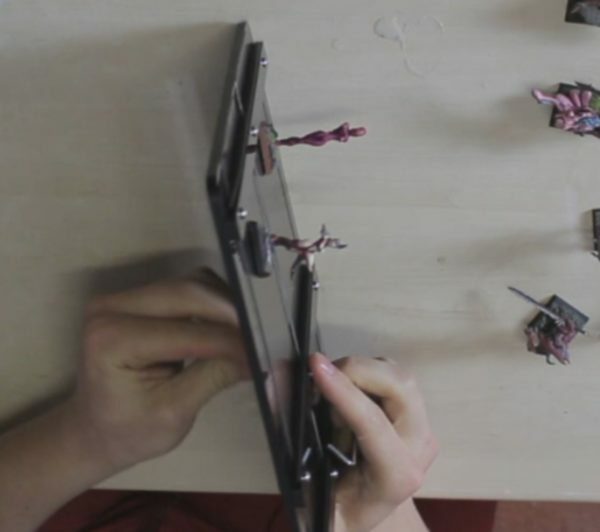 Or what if you already have a bunch of magnetized minis? What about those tanks and vehicles made of brittle resin, all without bases? Or spider-legged demon artillery? Terrain pieces? And also, who the hell am I to tell you that you shouldn’t magnetize your models? Now you’ll do it just to teach that presumptuous ShapeShift man a lesson and put me in my place! I concede. Those are all valid points. Which is why we now offer steel sheet attachments for ShapeShift trays. You can remove most of the sliders, clamp down some sheet metal with the remaining two, and you’re good to go with your magnetized miniatures. So why not get a made-for-magnets bag to begin with? Because you can switch between the ShapeShift system and magnets at your leisure, all with the same bag. Heck, you can use the same tray in one capacity one day, and then switch it around for a different game some other time. 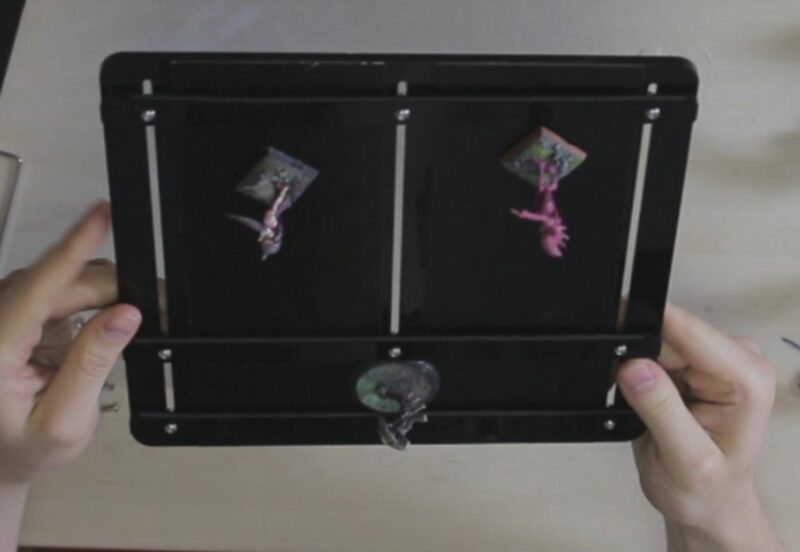 Part of your tray can be used for magnetized minis, and the remaining space can use the ShapeShift system as you can see in the above image from the Evo demo video. Seamless… And the possibilities are limited only by what you want to do! You can decide that there are a few models in your collection that warrant magnetizing… But you just don’t want to bother with converting the rest. No problem! Use one bag to carry them all. 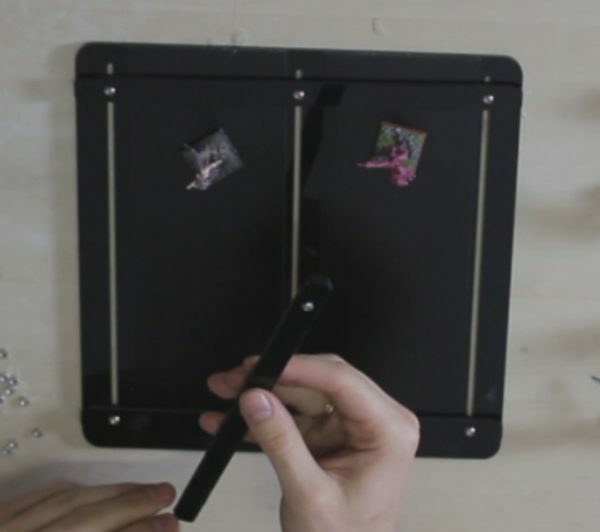 Save your precious hobby time and use it for painting, gaming or posting online about how you want to paint or game but just don’t have the time, instead of attaching magnets to bases. Yet another option is magnetizing terrain pieces such as extra buildings, walls or trees if your game or faction needs them. That way you can use the plates even if all your models have bases and use the Overlord bag to carry extra stuff you’d normally put in an additional box. Our plates come in 80mm strips that run the length of the tray. You can cover the tray with two strips. All plates are painted black on one side and grey on the other. You get 2 plates for the listed price. This product is designed for use with ShapeShift Evo trays. Please don’t order these plates for the older model of the ShapeShift tray – they are too long and won’t fit! Importat disclaimer for U.S. customers: we checked and since our plates are essentially cut pieces of sheet steel, they might be subject to the 2018 presidential tarrifs on steel and aluminum. They’re separate products, painted and cut to a small size, so there’s also a good chance they’re not covered by the tarriffs… But be prepared to pay a 20% tarrif in addition to the total price of the plates upon your order’s entry into the USA. Keep in mind that U.S. buyers are responsible for paying these tarrifs, not foreign vendors – the fees are a form of import tax. Hence, we can’t just charge you 20% more and regulate the fees ourselves. Normally, orders below certain thresholds aren’t subject to customs fees at all so we can’t say for sure whether anyone will actually care to check the contents of your parcel.